A fter all the pageantry and solemnity of Good Friday and the other events of Holy Week, Easter in San Miguel, Domingo de Pascua, may seem a bit tame. It's the first day all week with no procession. The somber dignity of Good Friday is over. The streets seem almost eerily empty after the hordes of Good Friday. The cobblestones have been swept clean, but there is still a whiff of chamomile in the air. The Easter Sunday celebrations actually begin on Saturday with evening masses and fireworks (of course) announcing the good news. For the somberness is past. It's time to glory in the Resurrection of Christ. The release of tension from the heavy emotion of the preceeding days is palpable. Every church in town will have a special Easter morning mass, of course. And then, as the people pour out of the churches, the bells will begin. And the tolling will go on and on until you think the stones will be shaken right out of the street. Then everyone goes home for a feast. 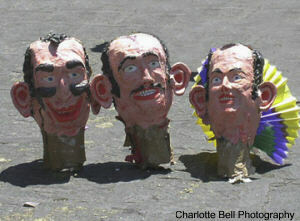 The most light-hearted event of Holy Week takes place at noon of Easter Sunday in San Miguel. 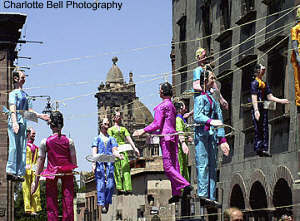 Big, brightly colored six-foot-high figures of papier maché and crepe paper are strung on ropes across Calle San Francisco on the north side of the Jardín. Although they are meant to represent the hated betrayer of Christ, Judas Iscariot, nowadays they are more comical characters and effigies of unpopular politicians and other authority figures. As many as two dozen of them will be strung on the ropes. Fireworks are wrapped around the waists of these hapless fellows (and the odd female, too). The fuses are lit and the fireworks begin to pop, setting each other off in a chain reaction. As they explode, the figures seem to be dancing. They jerk and writhe (hmmm, suffering the fires of Hell, perhaps?) Kids laugh and squeal, everyone covers their ears. Finally, with a great bang a Judas explodes, then another and another. Arms and legs go flying in every direction. Kids (and adults, too) scramble on the cobblestones to pick up the pieces, like children grabbing at the candies that fall from a piñata. It's a point of pride to go home with a papier maché arm, a leg, or—if you are quick and really lucky—a ghoulishly disembodied head. The tradition of the Judases goes back to colonial times, brought to the New World by the priests from Spain to teach the people about Judas' betrayal of Christ. They were meant to give quite visible and tangible proof that you never really get away with that sort of bad behavior. There are consequences. But this is Mexico, and no one wants to be serious today. So once mass is over, Easter in San Miguel is for fun, family and food. The events of Holy are nearly over. Easter in San Miguel de Allende is past. In the final event of the season, on the Wednesday after Easter in San Miguel, a final procession carries the statue of Our Lord of the Column back to Atotonilco.